I was asked to make another cake for a birthday a couple of weeks ago. 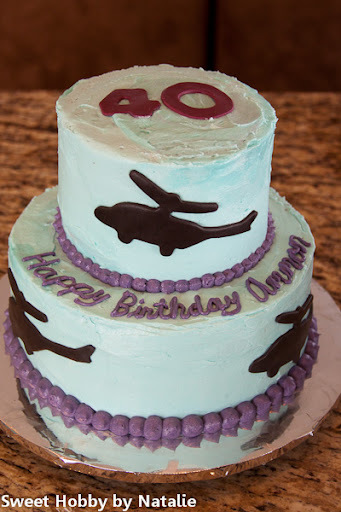 They wanted a helicopter theme with sky blue frosting and purple was the birthday boys favorite color. I also had a friend who wanted me to try out the Cricut Cake machine, so I thought I would use it to cut some helicopters, well I could not find anyone who had a Cricut cartridge with a helicopter image. I bugged so many people in our neighborhood and beyond to no avail. I looked for helicopter cookie cutters, there were some online but did not have the time to have them shipped. Called stores to see if they had a cutter but was told no. Well I decided to go to Gygi for other stuff and guess what they had a helicopter cookie cutter for only $.99. I was so happy. Wish they would have notice them when I called two days earlier asking for one. So this was my first two tiered cake and it is buttercream and when my husband and I went to place on the top tier it fell a little and my husband caught it. I tried to fix the boo boo's. I was not too pleased but did the best I could. I need to learn how to cover with fondant cause it will be so much easier I'm sure. Anyway got it done, it was picked up, and the stress was gone. I hope they enjoyed the Fudge Chocolate Cake with Chocolate Mocha Ganache filling! It sure smelled good.